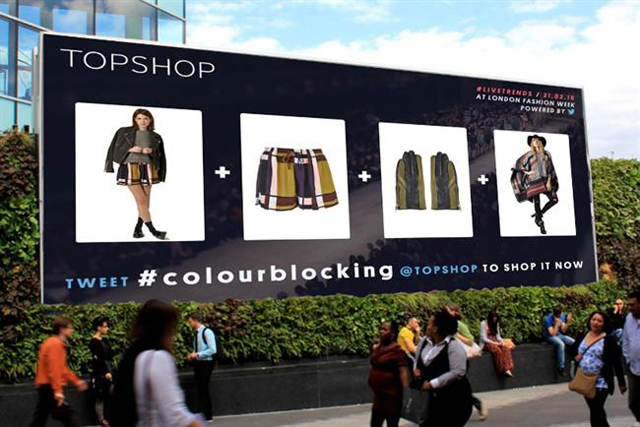 Topshop is to step up its digital innovation around London Fashion Week by giving its customers the chance to shop for key trends from the event, based on real-time tweets. The fashion chain is tying up with Ocean Outdoor, social marketing platform Stackla and Twitter to identify key trends from what the fashion industry is tweeting about during the event – which kicks off this weekend – and will flag up related products on digital billboards around the country. The six outdoor sites, powered by Ocean Outdoor, will be located in pedestrian areas of London, Leeds, Birmingham, Manchester, Liverpool and Glasgow and all within 10 minutes walking distance of a Topshop store. They will showcase live content pulled from Twitter data and a curated collection of Topshop products that fit the trend. Customers who tweet @Topshop with the a specific trend hashtag, such as #pleats or #utility, will receive a tweet with a curated collection of styles that fit the trend and can be purchased straightaway. The fashion chain will also screen its Topshop Unique catwalk show at its Oxford Circus flagship, which will feature a vending machine created by createlondon.co.uk that customers can tweet in return for treats. The retailer’s catwalk models will also be visiting a Vine booth before they take their turn on the catwalk, with the videos then being shared across social media and Topshop.com as they appear on the catwalk, and on TOPSHOP.COM as they appear on the runway. Sir Philip Green, boss of Topshop owner Arcadia, said: "Whether we are giving them a look behind the scenes at the show or partnering with a global platform such as Twitter to allow them to shop the trends in real time, our aim is to create a truly inclusive experience." The partnership is the result of a major competition called The Art of Outdoor by Ocean Outdoor. Ocean CEO Tim Bleakley said, "This campaign is striking for its immediacy and relevance to it target audience. Here’s proof that premium digital out of home really is the media of the moment to get your brand noticed."